Here's a great gift idea for the Dad looking at options to his current gas powered lawn mower, the new homeowner Dad, or someone simply in need of a new mower. 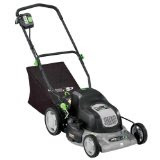 Cordless electric lawn mower featured @ Amazon.com . You can check out other Electric Lawn Mower options also @ Amazon.com .